Arnie n Michael fix up my presurgical orthotic so that I have something while they work on my real one which will be ready in several weeks. My question is what is a bad pain? My first day with this orthotics; I am better than I have been since 1/2012. Dr Blake's comment: Therabands are a very difficult exercise to do correctly and can take a skilled podiatrist and/or physical therapist to help you do it correctly and safely. Here is the link most likely to help. My podiatrist continues to just say my R ankle is structurally sound. But I have been doing them differently from your blog; works quickly n well all the way up to the thigh. He asked me to see a rhumatologist last year and I did and to get Pilate txs for my core. He finally wrote for more PT to treat my lower exts as well as hips; I am to use my own insurance for Work comp has denied all tx as of 10/2011 so I have not seen s PT til this Jan.
Is it normal/ok to have this slight pain at the end range of exercise behind ankle bone? Dr Blake's comment: Yes, and it is totally fine. You should avoid the end range of motion in either direction as you do the therabands. It is where the internal tissue is either too stretched (in one direction) or too compressed (in the other direction). Is it okay to kick in the pool by swimming or be in water exercise class if I am having pain? Dr Blake's comment: Again, the article on Good vs Bad Pain should be memorized. You must know the difference to rehab correctly. Does tight Achilles cause you pain straight down around your ankle bone? I had the absolute pleasure on seeing Amanda as a patient, since she lives locally. Amanda has what 10% of the population has, over supination. This motion was not really helped by her orthotics, so I adjusted them. Excessive supination as shown in the links below is devastating on peroneal injuries since the peroneal tendons must stabilize the ankle and resist the over supination. By controlling the excessive supination, the peroneal tendons should not have to over work and her symptoms should improve. I was able to see that she had Peroneus longus weakness, no achilles tightness, no scar tissue issues, and stable shoes. She should do just fine. I came across your blog and just had wanted some advice. My wife fell off a ladder doing some house work and fractured her sesamoid bone. She has been in extreme pain ever since. We have seen numerous doctors and foot and ankle specialist to help alleviate some of the issues she is having, to no avail. She injured her foot on December 31st 2011. The pain has not stopped since. She is pain medicine but that just dulls the pain momentarily. All the doctors/specialist we have seen seem to be giving us the run around saying things like “this is a complicated situation I really cant help” or its got to heal on its own type answers but no relief from pain. I know sounds unbelievable right. Also she has been in a hard cast for about 5 weeks, then a soft shoe, and now in a boot. Pleas doctor provide some serious help, I hate to see my wife in so much pain. Get a current MRI to check the status of the healing. Ice the bottom of foot for 10 minutes three times daily, up to 10 minutes every 2 hours. Create a pain free environment for all weight bearing activities even if that requires crutches, boots, special shoes, etc. 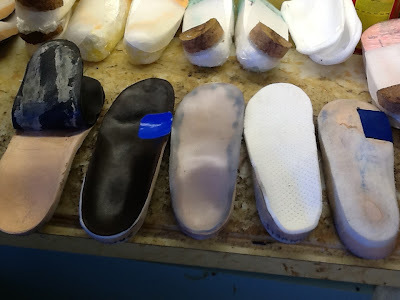 Make sure the shoes and orthotics that you are wearing do protect the area (go to a shoe store and try on various shoes with your orthotics and feel the difference each one makes at changing the stress through the area---you may be surprised what feels the best). Make sure your orthotics have some form of dancer's pad to float the sesamoid. Get a bone stimulator if the doctor feels that the fracture is slow at healing (I love the Exogen unit from Smith and Nephew). 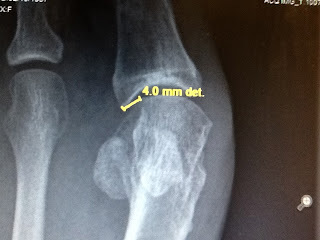 Since this is a fracture, bone health is critical. 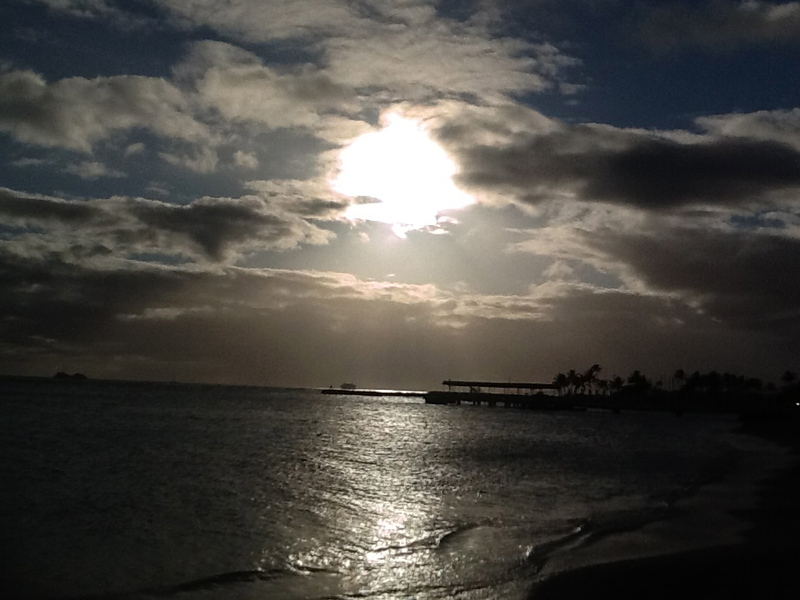 Have your Vit D levels drawn to make sure you are in a good spot. Get a bone density screen to see where you are compared to normal. If not already, start taking 1500 mg Calcium daily and 1000 units of Vitamin D.
Analyze what you are doing during the day that really aggravates and avoid that with a passion. Learn to spica tape (I have several videos on different techniques within this blog. Consult with a pain specialist to help reduce the pain level so that you can rehab the leg. If the pain is too great, the patient will not weight bear, and the area gets weaker and weaker. Here is the latest update. The right foot neuroma pain has maybe gone down around 30% since my cortisone shot 6 days ago. Although now I am beginning to have very sharp nerve pain in my left foot pad area. It happens when I am walking and step-off. The pain is a sharp nerve pain located just below the big toe in the foot pad area. The pain will shoot across into the foot pad area just below the 2nd and 3rd toe. This nerve pain is also located in my right foot now. It is identical to the left foot area in both the type of pain and location. So in essence I have 3 issues going on; Mortons Nueroma (right foot - between 3rd and 4th toe), Metatarsalgia/Nerve Nueropathy in the right foot pad area, Metatarsalgia/Nerve Nueropathy in the left foot pad area. I have no other pains in my body besides my feet. I have flat feet and I over pronate when I walk (as verified by my shoe wear pattern). I also did the electronic foot pad test which showed my pressure points and I was all deep red in the foot pad area and the base of the heel. Dr Blake's comment: I will have to look into the test you deserve, for I have not heard about it. But, you presentation of nerve pain shows what happens when you stir up one nerve, the others seem to chime in quite easily and without much provocation. The nervous system is a super highway from brain to feet with small switches in the back area. It is easy to hurt one nerve in one location, and have symptoms develop in other adjacent nerves or the same nerves in the opposite foot. It is interesting to study, but not to have. As mentioned, I am 39 years old, don't drink, don't smoke, not overweight, I had my blood work done about 6-8 months ago and all was OK except for Vitamin D deficiency, which I have been taking 5,000units per day as per my doctor recommendation. I have since dropped down to 1,500 units per day in the past 2 months. My glucose levels were fine. Never tested for mercury levels or Vitamin B levels. Dr Blake's comment: Glad you are working on the Vit D. This deficiency can cause a lot of foot pain, and I should be testing this more. What is your level right now? Our lab is 30 to 85 normal, but I want my athletes around 55 if they are competitive. Definitely get a B12 level drawn, simple enough to do. Very frustrating to be dealing with all of this but from what I gather it can be poor foot mechanics and/or Vitamin B deficiency. I have started to take Vitamin B supplements. Blood tests done 8 months ago did NOT check for Vitamin B levels. Right now I am taking Vitamin B12, B1, B6, Magnesium. I have also increased my fish oil intake along with Olive Oil intake to help with inflammation. Dr Blake's comment: This is great. Vitamin B is known to cause foot nerve pain when low, and overall inflammation can be reduced by modifying what you eat. Dr Blake's comment: I love the Hapad Longitudinal Medial Arch Pads with the adhesive backing. Typically the small size works well with most. 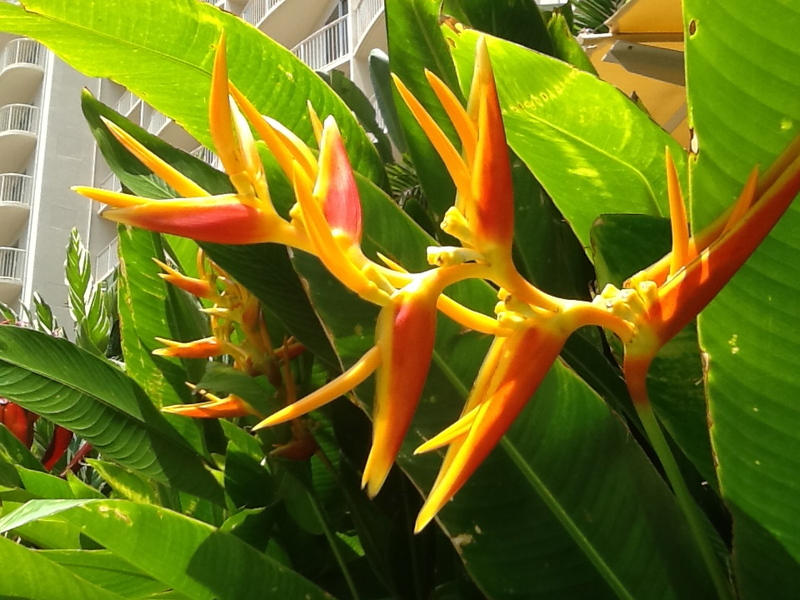 It is placed behind the sore area and can be quite miraculous for nerve pain like you describe. Have you ever had patients with Vitamin B deficiencies that caused Metatarsalgia? If so, what is the timeline to see nerve pain reduction in those cases? I read online about 3-6 months. Dr Blake's comment: First you get the Vitamin B to normal levels, then you wait 3-6 months to see if it helps. Of course it can help. It is one of those deficiencies that has well been documented to cause nerve pain. Sure hope this has helped some. 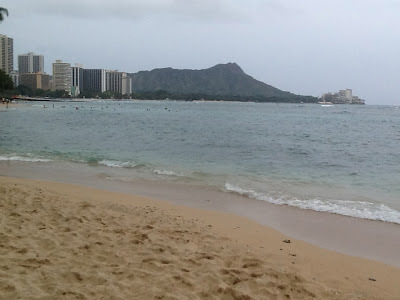 Diamondhead on a somewhat cloudy day!! It has been 8 weeks in the aircast boot with no progress. I am not working out or doing anything beyond walking in a parking lot, from my car to work, etc. I do have to admit that when I am at home, I take off the boot to breathe a little and walk around (minimally) -- I make sure not to bend my toe or anything.... Anyway, I feel no progress. My foot is still swollen to the point that my shoes no longer fit the foot (I only put a shoe on to make sure that I was not imagining the swelling). The swelling appears to make my foot wide--I think what swells is the arch area, esp. underneath it. 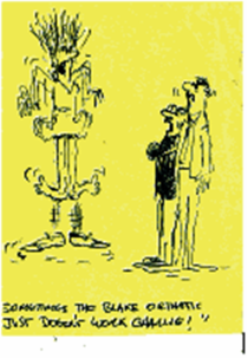 The swelling occurs both in and out of the boot, with walking and without walking. I also still have pain at the top of the big toe, and around the ball of my foot and arch. O, and when I elevate my foot, my big toe sometimes twitches uncontrollably. Considering that 8 weeks was the top of the healing timeline--do you think that there is an additional problem here? I am saddened to not feel any progress and REALLY scared. Why the swelling at this stage, and why the same type of pain? 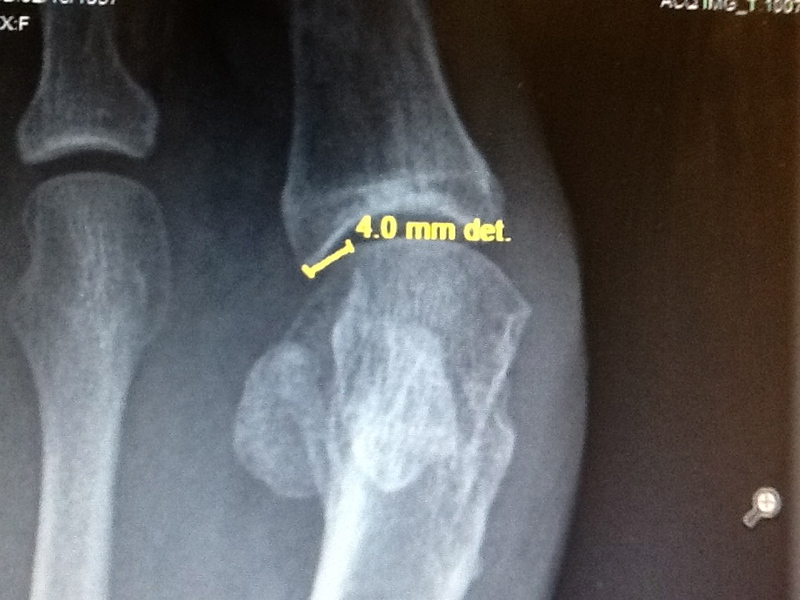 If you remember, you ruled out the possibility of semamoid fracture when you looked at the MRI I mailed--my ortho agreed. The podiatrist, however, still is diagnosing me with sesamoiditis and a possible sesamoid fracture. I am attaching a picture of my swollen foot--I am so embarrassed to be sharing this with you, but I feel that I have no choice but to do so. The right foot is the swollen one--it may be difficult to tell, but its much wider than the left, and much more red in color. I can't believe I mustered the courage to attach this awful pic, but...I am assuming you see worse. The pic doesn't do the swelling justice, but trust me, my foot does not fit in a shoe that I could fit into with absolutely no problem in December. Does my non-progress concern you? Like I said, I am seeing my ortho in a couple of weeks, but also wanted to get your thoughts on all this. Again, thank you so very much for your help, always. Thank you for your wonderful suggestions. I was feeling very worried and I moved up my doc appt to earlier this week. He was not impressed by my state and told me that I am ready to take off the boot and walk in normal shoes. He told me to walk through the pain and that to worry only if the pain is great enough to make me limp. I am also going to start PT - he said it would be painful also. I walked without the boot today like an idiot and I am complelty back at square 1. Same exact pain that got me to the podiatrist in the first place. If I'm just not going to heal - what is my worst case scenario here! Dr Blake ? Do they surgically repair grade 2 big toe plantar tears? Would it be a difficult surgery and recovery ? Have you heard of a grade 2 tear not healing on its own ? 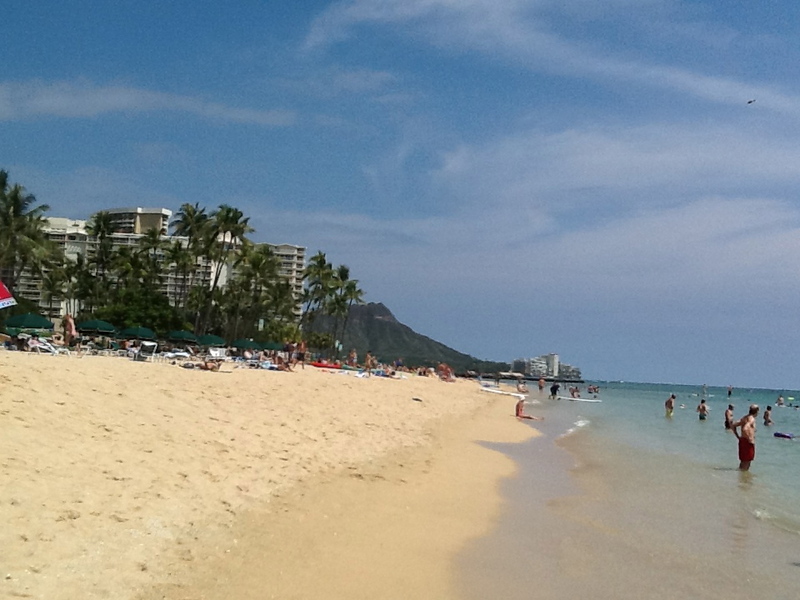 I'm sorry to bother you , I wish that your office wasn't across the USA for me !! Thank you again. 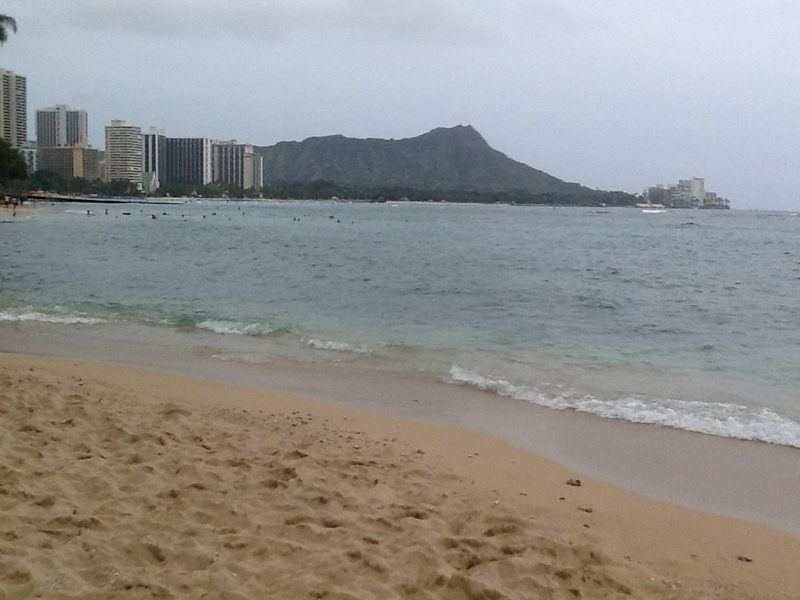 Hi again Dr. Blake--thank you for the suggestion. I put the boot back on and the pain did improve a bit; the swelling continues with/without aggravation, the pain that I have remains in the ball of the foot and the base of the big toe (almost to the side of towards the second toe), and also at the big toe joint while pushing off... I have also been icing and elevating. I will start PT this week sometime. I do not understand why my foot ortho (who is well regarded in my area) would tell me to take off the boot and walk through the pain although I showed no outside signs of improvement. I am annoyed at myself for listening to his suggestion, which went against my gut feeling--I guess I just wanted to wear 2 shoes again! Then, they will have to guide you how to regain all of your pre-injury activities: starting with the least stressful on the joint, and progressing to more difficulty. This delicate balance is why physical therapists and athletic trainers rule the rehabilitation of all the professional sports teams. The orthopod or podiatrist is called in for diagnostic and procedures only. I have a few questions, and hope to get your thoughts... Just to keep it organized on my end, I am lumping the questions below. Again, thank you for giving me support all the way from across the country. Your responses mean a lot, and I value your opinion. 1) is it possible to un-do any progress i have made to the ligament in the last 8 weeks by walking through pain and without a boot for 1.5 days? as the pain that was elicited while walking was the same exact pain that got me to the doctor in december, at the beginning of the injury? Dr Blake's comment: Daily an injury gets more healed and less fragile. Feeling the exact pain is no indicator of complete set back. Feeling the exact pain just means you picked on the weakest link in the chain which is the injured area. It is hard to completely re-injure something, your body's self preservation system normally prevents that. Flare ups are more judged by the amount of time it takes to get back to where it was before the flareup. 2) my non-progress at 10 weeks of immobilization seems weird to me, as the plantar plate tear has been described to me as small and located in a stable spot. i have been diagnosed with a slight bunion on this big toe-could that be interfering with improvement? i bought a toe separator yesterday and have put it on. neither aggravated or improved any symptoms. 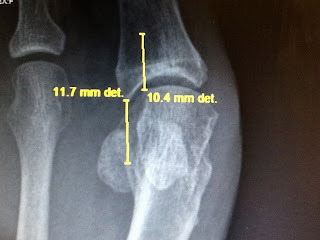 Dr Blake's comment: You have so much swelling in the photo you sent that it is normal to feel no progress at this stage. What appears to be a concern is whether or not surgery will be indicated? It takes months and months for me to decide on surgery in these cases. And since only less than 5% of patients with this injury need surgery, you will really have to prove it to your doctors that you need it. Forget the length of time, listen to your body, get to a good physical therapist knowledgeable on this injury (or at least likes to deal with foot injuries). 3) most importantly: what is my worst case scenario here? lets say that another 3 months pass and i see no improvement. is surgery an option for grade 2 turf toe if it doesnt respond to conservative measures? how likely does conservative treatment fail for an injury like mine? and, how difficult and effective is surgery, as a last resort? Dr Blake's comment: Of all the Plantar Plate aka Turf Toe injuries I have seen, I have never seen surgery to an isolated ligament tear when it involves the big toe joint. The big toe joint is so intrinsically stable that it tends to heal well. The same injury to the 2nd joint leads to surgery probably 50% of the time. I am sure however that surgery does happen, sometimes just to explore the joint when it keeps hurting for no explanation. A surgeon will have to give you some direction. My favorite recommendation in that area of a podiatrist is Dr Stephen Pribut if you want a local doc to give you another opinion. He is just wonderful. 4) lastly, any recommendations for a podiatrist in the washington DC metro area? See answer above. THANK YOU VERY MUCH DR BLAKE. you have been a blessing in this awful and painful journey. 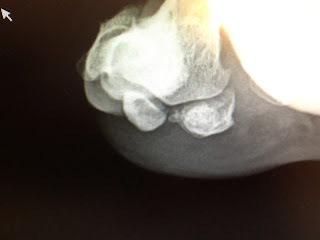 Our son had a soccer sports injury at 17 where his sesamoid fractured. 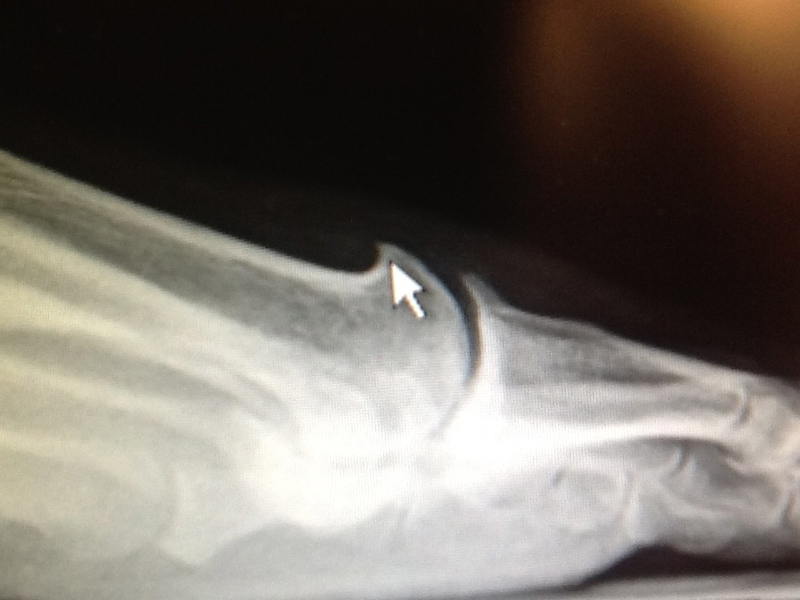 Unfortunately it never healed and the bone died. We live in on the East Coast near Boston. So it was removed and afterward my son spent many months in rehab trying to get to a point of comfort so he can run again. He hasn't been able to run or walk without discomfort and pain since. He's had countless visits to experts doctors that have tried to help. But no luck or real progress. So we've since gone back to our referring orthopedic physician to try again. He said that my son has full range of motion and doesn't think it's the sesamoid area because that area is healed properly. The doctor feels it inflammation and recommend stiff shoes and maybe ingested cortisone to help with the inflammation. But at this point basically nothing has worked as prescribed and it still hurts even when he walks normally. He's 19 years old now and we don't know what else to do. So I'm looking around for someone that's the best at foot therapy to find a way to get him back to where he was prior to surgery. We've used orthopedic foot beds, Physical therapy, cortisone injection, rest, hydro dissections and no luck. We feel the doctors we have know what they are doing but they have stated that my son might be that 1% who just isn't going to be able to heal properly. I can't accept that and I'm now looking for alternatives. Any thoughts and ideas would be welcome. All good questions which I will look into. I'd have to secure more details on tests, x-rays and such. Let me speak with my son on these topics and get back to you. There is always a source of pain, and identifying that source of pain seems the most important task right now. Testing with bone scans, MRI, xrays, CT, thermography are commonly used. Diagnostic injections with local anesthetic can test small and different areas at a time to see if numbing up one spot, like a tendon, can give complete temporary pain relief. Physical examination of tendon function, joint motion, areas of soreness, nerve sensitivities can help identify what is wrong. Partial or complete symptom relief with all the measures of treatment utilized can also help identify the problem based on what makes it feel somewhat better (off weighting, nerve gels, icing, taping, rigid shoes, etc). I just saw a patient Evan (name changed) that I have not seen in 5 years. He was 16 when he had a fractured sesamoid removed. When he was 17, almost 1 and 1/2 years post surgery, he was still in pain. He was a very good runner (4:26 miler pre injury). His treating surgeon was great, but had no answers to why he would still hurt. Physical therapy did not help. Evan went on to run 4:13 in college, and will run competitively for years to come. How did he get better? By analyzing his gait, I found that he crushed his big toe joints into the ground at forefoot loading. So inserts to protect that area (the area of the sesamoids) were custom made for him (which he no longer needs). By ordering every test imaginable, I discovered that his joint, the other sesamoid, the capsule (ligaments), the tendons were all fine, and he had no bursitis. The area rarely swelled even with level 9-10 pain. I suspected nerve entrapment, and diagnostic nerve injections gave complete relief of the pain for 3-4 hours. When Evan told me, that the pain he was having post surgery was the same as pre surgery, I began to also think the sesamoid was not the original source of pain, so removing it would have logically not produced pain relief. I suspected the nerve was continuing to be irritated every time he tried to run both before and after the surgery. When Evan related that he hurt the same during and after running, I decided to see how much he could run without making him worse. So, after 2 years of not running, Evan started a Walk Run Program to get up to 30 minutes running. Then Evan processed to running 60 minutes straight, and he was released to go back to Track for his senior year when he was up to 10 miles straight. 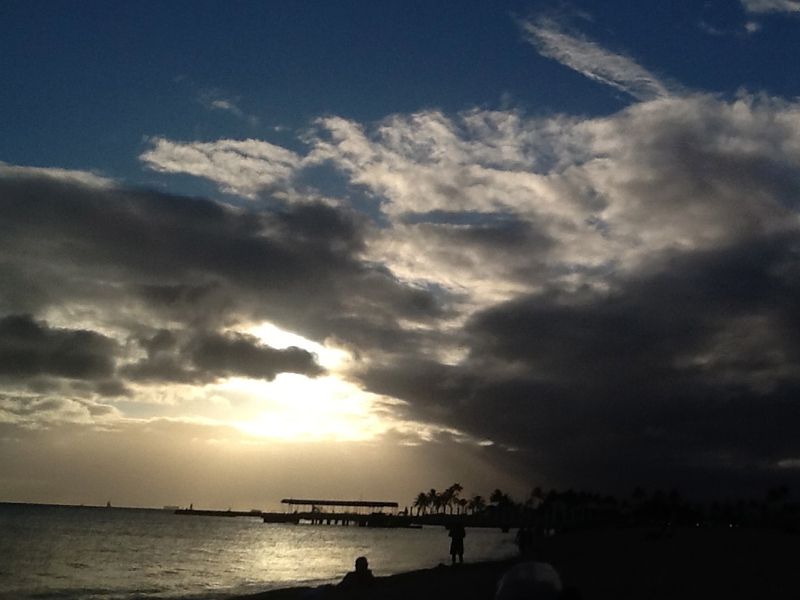 Evan understood that he could not run through sharp pain, pain that increased while he ran, and could not limp. Those were all signs of bad pain. Evan's pain stayed the same through this 6 month course of training. And, if you asked Evan what his pain level was, he would say 7 or so. The custom orthotics protected him, but the nerve remains very sensitive to any pressure for a long time (several years). But, Evan nerve did heal eventually, he learned to run softer and apparently faster. Evan is a great example of why when I rehab athletes who run as part or all of their sport, that I want them to run at least 3 times a week. Can they run one mile or 5 miles before the pain increases? There are hundreds of possibilities during rehab created by this procedure. So, Michael, for your son, that is info I would also love to know. This pain is so extreme that it makes me cry sometimes. I am a very busy person, I work full time in an office setting, in a high demand management position, I can't sit 40 hours per week, I'm usually on my feet about 1/4 of the day. I have been diagnosed with Mortons Neuroma I guess in both feet. Previously my Podiatrist told me that the pain I have been experiencing was "Inflammation in the Joint" but not arthritis. Now I have had a few cortisone shots, probably a few per year, and I also wear custom orthotics, the kind that are hard and plastic, they don't bend. I have no idea what amount of cortisone shot I am getting, but they are always painful. The shots seem to help a little at first, but wondering what I should do? He said if the pain keeps up he is going to suggest I look into the option of surgery, and I'm scared of surgery and all the down time. My husband is currently not making that much money, he is searching for better paying work, but I am the main breadwinner of the family, and I can't imagine how I will do my job and be off work to heal from foot surgery on both feet. Can you tell me something simple I can do? I am also trying acupuncture, and looking into other things I can do for the nerve pain. I own a TENS unit, and I am brave enough to try it on my feet. It might work. I usually just use the TENS unit on my back. I broke my tailbone years ago and suffer from chronic pain. Please help. Any advice is appreciate. Thank you so very much for your email. Below are 2 links to general blog posts on Morton Neuroma care. You need to calm the area down. Of course, it is much harder since it is on both sides. Sometimes, even though there is more pain on one foot, I will treat the less painful side for awhile and hope the other side does not get worse. See if you can try a removable boot (like the Anklizer with an EvenUp) for the 25% of the day you are on your feet. You first have to see if it helps you. If it does, alternate days between the right and the left side. If that helps, you have be helped with more traditional shoes that either rock n roll or are stiff across that area of your foot. You can try hiking boots or the New Balance 928. Even the Hoka shoe line has helped some patients get through the day. As you look for foot wear to mechanically help, begin using a reusuable ice pack to cool down the area three times a day, whether it hurts or not. The ice pack can be placed on the ground with both feet on top. Do 10 minutes three times daily. If the ice is wonderful for your symptoms more cortisone shots are indicated. If not, you still may be a candidate for the 6% alcohol shots. Remember, shots are meant to get you by in your scenario. Delay the need for surgery for awhile until time is right financially in your case. However, many many many patients with shots (cortisone or alcohol) have never needed surgery. But, I would go into the shot world with the initial expectation of just delaying the inevitable. Alcohol shots definitely work better when contrast MRIs show no neuroma, but they can help no matter what the MRI says. Nerve Pain is local to the foot and systemic to the whole body. Your treatment should reflect that. Locally, you calm the nerve down with moist heat, icing and/or contrasts (finding out what seems to work the best), topical NeuroEze or compounding creams/gels, finding out whether you should get another cortisone shot based on dosage (typically 30 mg of long acting cortisone per year in any one area is maximum), alcohol shots, adjusting the orthotic devices for more metatarsal padding to spread the metatarsal apart to let the nerve through and off weight the sore area, accommodative padding to completely off weight the area, looking into all types of shoes for work that seem to be the right cushion, stiffness, openness to avoid compression of the nerve, stability and heel lift (you may be surprised what shoe feels the best), acupuncture or physical therapy, TENS, and chiropractic. Nerve pain is the worse pain to have. Nerves run along a superhighway right to the brain. Patients with nerve pain that involve the brain's interpretation tend to have more pain than they should. Many times, even when the nerve pain is local, when patients report pain levels of 7 to 10, a systemic approach must be taken. This typically involves medications to de-sensitize the pain including gabapentin, lyrica, cymbalta, nortriptyline, etc. This typically takes a pain specialist, working with the podiatrist or orthopedist, to get the pain level to the more acceptable 0-2 range. I sure hope this helps you in some way. I am sorry for the delay. I was off on vacation, and rest was much needed for my soul. If you only knew how hard I tried to make Sam comfortable (name changed). He had disabling sore feet under the big toe joints. It was more the skin that hurt than anything else. For the last year, he has been a little better with his memory foam orthotic devices (Hannaford style). I tried 6 different topcovers, Shear Ban (blue anti- friction patch), and various accommodations including cutting out the insert and shoe in the area of soreness. Finally, the medical suppliers at JMS Plastics sold me 3 mm J Gel to cover the orthotic, and Sam pronounced a cure. 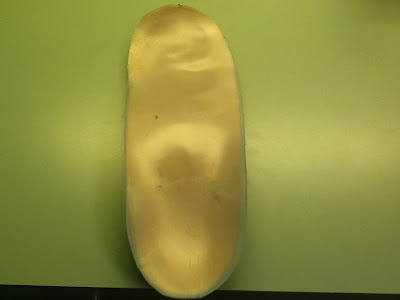 Here is a collection of some of my custom orthotic devices with various accommodations, topcovers, etc. The middle insert is seen with the 3mm J-Gel from JMS Plastics. The J-Gel has a smooth side and sticky side. 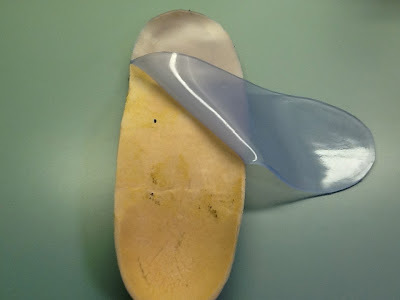 The sticky side down against the orthotic device. You can not glue J Gel. The J Gel on top of the custom made orthotic device. This is an AP Foot Xray with highlighting of the big toe joint. The metatarsal head is rounded and the toe has slipped off the joint on the side of the 2nd toe. This is very painful. The soft tissue on the lateral side (2nd toe side) is pinched and causes pain called capsulitis. Treatment is partially accomplished with toe separators and bunion taping to straighten the toe. 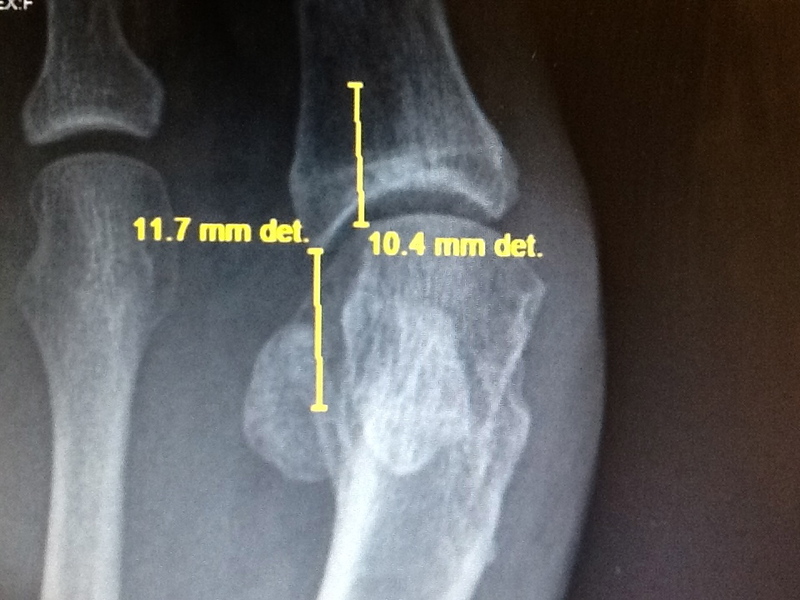 This same xray shows that the joint dislocation is measured at 4 mm. This patient was in for a 2nd opinion following failed bunion surgery. Failed from the standpoint that 3 years after the first bunion surgery, the bump is coming back and pain is settling into the joint with activity. In this xray the numbers do not mean anything. I wanted another way of showing that 4 mm dislocation of the toe on the metatarsal head. This patient did great with toe separators to push the big toe medially back onto the top of the normal part of the joint. Any workup for Bunions should include a Plantar Axial Xray. This gets the bottom of the big toe joint and can reveal interesting findings. Here the lateral (fibular) sesamoid is damaged with also lateral first metatarsal spur. The xrays for a bunion workup should be weight bearing. Here the lateral projection shows a dorsal spur seen in Hallux Limitus, not typically in bunions. Also noted is spur on the dorsal surface of the toe bone (proximal phalanx). These would have to be removed in bunion surgery, and not only increases the time of post operative physical therapy, but also lowers both the overall joint motion and pain free expectations. 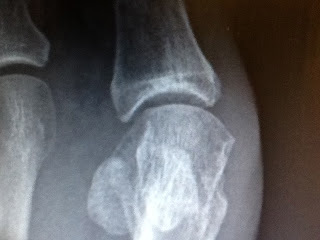 This AP Foot Xray shows breakdown of the lateral part of the joint. See how the joint space is wider (healthier) on one side of the joint, and narrower on the other side (where the arrow is). This means that the joint is arthritic. Bunion surgery without discussion of special attention to this area will be unsuccessful. This joint should be considered an arthritic joint (Hallux Limitus/Rigidus) not a bunion joint, and surgery should be done accordingly. Several years ago I introduced a wonderful method of stretching out a very tight muscle/tendon. As a podiatrist, I use it the most on tight achilles tendons, but it was first introduced as a method to stretch out the quadriceps post knee surgery (Temple University study). So many podiatrists, knowing the dangerous effects of a tight achilles tendon, opt for surgery to lengthen the tendon. This causes a 2 year rehabilitation program due to the scarring, and severe weakness following the surgery, and not counting the dramatic changes in gait. A more gradual process to lengthen the tendon is with prolonged heat/ice stretching. I measure my patients before and after both gastrocnemius (knee extended) and soleus (knee bent). The typical program is 45 minutes of straight stretching where you change the hot pack (30 minutes) for a cold pack (last 15 minutes) without the patient stopping the stretch. I will make sure the knee does not hyperextend during the stretch. I will start with 10 minutes heat and 5 minute ice the first time making sure the patient can tolerate this. If you can develop a stretch like this 2 to 3 times a week, along with their normal achilles stretches, you should see great results. Here a sports cord is wrapped around the waist of the patient and then the foot and tightened. The patient should feel that the achilles tendon is maximally stretched. The initial heat pack can be seen under the leg. It is the calf muscle, not the achilles tendon, that you are heating up. It has been 8 weeks since I started wearing the air cast boot. I am not working out or doing anything beyond walking in a parking lot, from my car to work, etc. I do have to admit that when I am at home, I take off the boot to breathe a little and walk around (minimally) -- I make sure not to bend my toe or anything.... Anyway, I feel no progress. My foot is still swollen to the point that my shoes no longer fit the foot (I only put a shoe on to make sure that I was not imagining the swelling). The swelling appears to make my foot wide--I think what swells is the arch area, esp. underneath it. The swelling occurs both in and out of the boot, with walking and without walking. I also still have pain at the top of the big toe, and around the ball of my foot and arch. O, and when I elevate my foot, my big toe sometimes twitches uncontrollably. Considering that 8 weeks was the top of the healing timeline--do you think that there is an additional problem here? I am saddened to not feel any progress and REALLY scared. Why the swelling at this stage, and why the same type of pain? 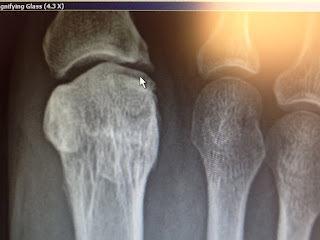 If you remember, you ruled out the possibility of sesamoid fracture when you looked at the MRI I mailed--my ortho agreed. The podiatrist, however, still is diagnosing me with sesamoiditis and a possible sesamoid fracture. Thanks for sharing. I am sorry you are struggling so. Most likely, the immobilization and velcro straps from the boot are not allowing the blood to return easily into your circulation. This will make you hold swelling and it is a common part of immobilization. It is important to begin to ice the foot for 10 minutes 2 times daily and do contrast baths (see blog) each evening. Every chance you get have the boot off and massage the calf where the velcro straps are. Whether you are in the boot or out of the boot, elevate your foot somewhat off the ground (even inches can help). Keep your knee slightly bent to avoid irritating the sciatic nerve. You have to work hard on creating a pain free environment. I am assuming that your foot does not hurt in the boot. Since you are at 2 months with all this swelling, physical therapy will be in order once the doc says you are ready.